The scalable New Hampshire map on this page shows the state's major roads and highways as well as its counties and cities, including Concord, the capital city, and Manchester, the most populous city. To display the map in full-screen mode, click or touch the full screen button. To zoom in on the New Hampshire state road map, click or touch the plus (+) button; to zoom out, click or touch the minus (-) button. To scroll or pan the zoomed-in map, either (1) use the scroll bars or (2) simply swipe or drag the map in any direction. (The scrolling or panning method you use will depend on your device and browser capabilities.) At any time, you can display the entire New Hampshire road map in a new window or print this page, including the visible portion of the map. New Hampshire's Interstate Highways connect its major cities and facilitate travel between New Hampshire and its neighbors. I-89 extends northwestward from I-93 at Concord to the Vermont border. I-93 crosses the state from southeast to northwest, whereas I-95 runs along the southeastern coastline between Massachusetts and Maine. Auxiliary Interstate Highway I-293 serves the western and southern sides of Manchester, while I-393 connects I-93 with Concord's eastern suburbs. A 120-mile trip from Hanover to Glen showcases some of the state's natural beauty and extreme seasonal differences. Hanover is home to Dartmouth College, as well as quaint shops and coffeehouses. The drive continues through Orford, Bath, Littleton, and Bethlehem before passing through Crawford Notch State Park which is home to Arethusa Falls, the highest waterfalls in the state. Visitors to nearby Mount Attitash can ride a chairlift to its 2,300-foot summit and enjoy panoramic views from its observation tower. 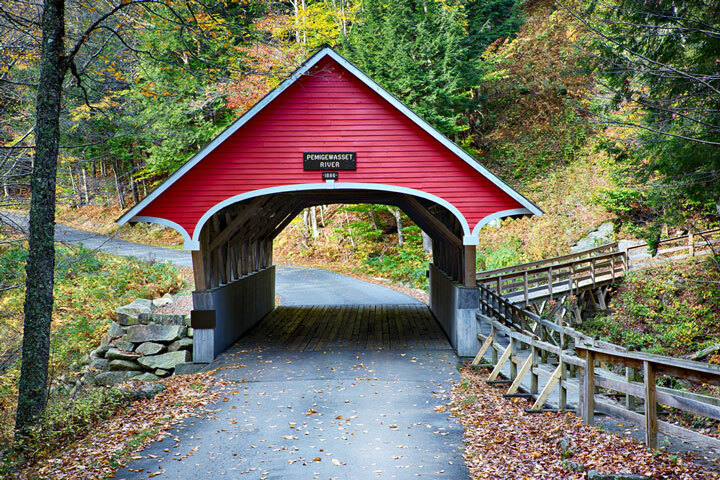 More information about scenic roads in New Hampshire is available on these America's Byways: New Hampshire and New Hampshire Scenic and Cultural Byways pages. For more information about New Hampshire's roads and transportation infrastructure, visit the New Hampshire Department of Transportation website. For New Hampshire road traffic conditions, visit the Federal Highway Administration's New Hampshire Traffic Information page.